"We want to thank you for making the process of financing and refinancing for our investment as smooth and painless as possible. Your outstanding professionalism helped move potential delays along and allowed us to complete the transactions on time. You’ve got our endorsement! We’ll definitely reach out to you for our next purchase, and won’t hesitate to refer you to our friends, family & associates." "Greg is the Best, Plain & Simple"
Maurice Spaventa & Peter Mossadis-- Washington, D.C.
"I have known Greg Darlin for several years and have been impressed by his performance and the enthusiam for all tasks which he posseses. 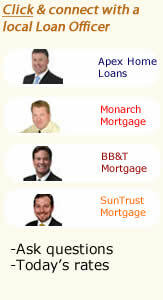 Mr. Darlin stood out immediately as being that number 1 loan officer. His performance is professional and has gracious consideration to his clients. It is my sincere pleasure to recommend Greg Darlin to anyone who needs a Loan Officer." Deotha Goins -- Washington, D.C.
"This is my fourth transaction with Greg. He is very smart, personable, and trustworthy." "Greg found us a great rate. He worked with us even when we changed our loan parameters. Greg did a wonderful job for us." "Greg Darlin is the best and most competent person I have worked with on any loan." "Greg did an exceptional job at handling our loan needs. Our loan was complicated because it involved not only myself but my parents as well. Greg has a vast amount of knowledge regarding not only the loan programs but also real estate issues. He always made himself available whenever questions arose. I fully intend to process future loan needs with him." "Greg was extremely down to earth and very knowledgeable. He was extremely professional. It was a pleasure working with him." "Greg was very professional in every encounter and correspondence. He worked diligently to secure the best rate possible for my loan. I have already recommended him to my friends and realtor."